Dog Drinking From Lake: Is it Safe? Dogs drinking from the lake seems natural. But intestinal diseases like giardia from drinking untreated water could cause serious problems. Q: Our dog is always drinking from the lake near our family camp. Can dogs get intestinal diseases like giardia from drinking untreated water? – Carolina Firestone; East Lansing, Mich.
A: Yes, it is possible for dogs to get intestinal diseases from lake and river water, as many parasites happily live there! Both giardia and crypto-sporidia are transmitted by ingesting water infected by animal feces. 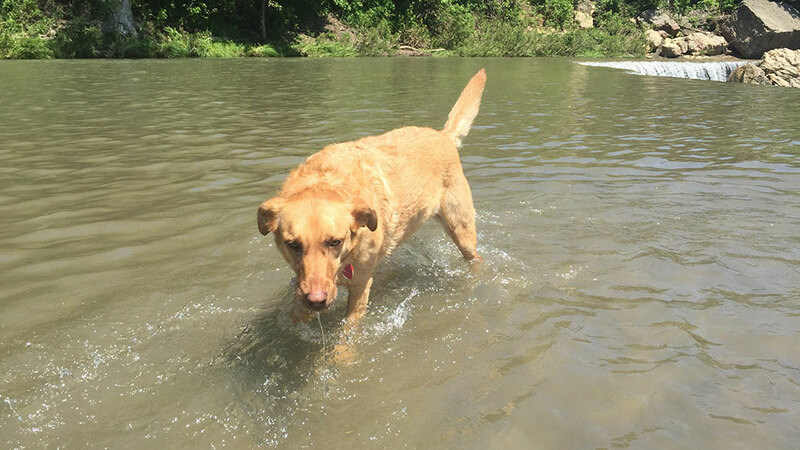 On an average lake, your dog’s chances of contracting giardiasis (also called beaver fever) or cryptosporidiosis (crypto) are pretty slim. It would almost have to be perfect: An infected animal just happens to defecate near where your pet is drinking, and the protozoa are concentrated enough to make your dog sick. It doesn’t happen often. However, if your dog is happily lapping water from ponds, swamps and beaver dam areas, you will want to put a stop to it, as the likelihood of getting ill from such stagnant waterways is much greater. Not only will your pet be more at risk for high concentrations of parasites, it may be drinking water that contains blue green algae; this is very often toxic to dogs. A major sign of both giardiasis and crypto is diarrhea. If you think your dog has an intestinal illness, your vet can do a stool test to verify. The good news is that these illnesses are easy to treat with one or more rounds of medication. Intestinal illnesses for the most part are not life-threatening. It would be extremely hard for an otherwise healthy dog to die of giardia or crypto. On the other hand, if your dog already has a compromised immune system, then you will want to do your best to curb its appetite for lake water.